Pobox Blog: See something? Say something! When we make major site changes, we keep access to the old pages available, in case there's some unusual situation that causes the new pages to fail for someone. But minor changes can sometimes bite just as hard. 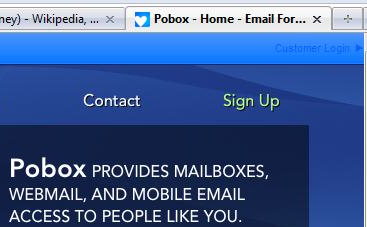 We removed the Login text boxes from the top of www.pobox.com. (This change was the result of changes to Internet Explorer 8's security settings, which said that page was insecure because it was loading the blog headlines.) Looks fine, right? Ouch! That was all it took to realize that all those messages about the "missing login" were not about missing text inputs ... people couldn't see the button! (Thank you again, Debbie.) Most people told us, "I assumed you knew, and you just hadn't gotten around to fixing it." That's why we love to ask for screen shots when people report a problem. It's amazing how many questions/debugging sessions can be short-circuited by simply seeing what you're seeing. So, if you're seeing a persistent display problem with the site, please let us know! The grass may actually be greener on our side of the fence, and we just don't know about the issue you're seeing. Is the site down? 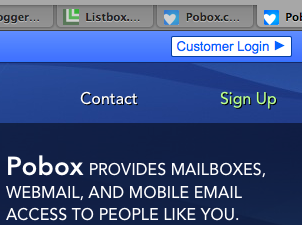 Can't get to webmail.